Home / soil / Water logged soils- what to do? Water logged soils- what to do? We have had so much rain recently and I am always being asked what to do in the garden. Well there are so many things you can do and not do in the first place to ensure you don’t damage your garden. First of all what is water logged soil? 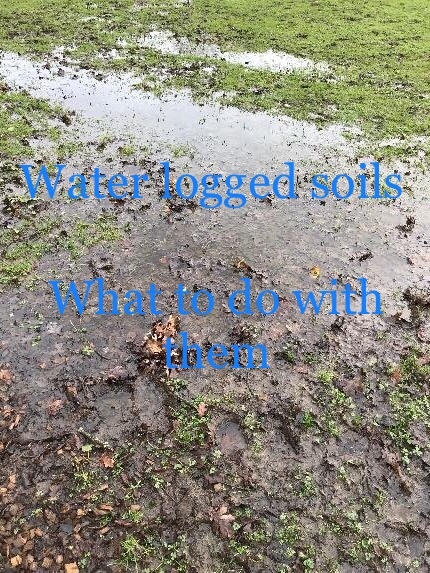 Well it’s soil that’s had so much water it can’t take any more, most of the spaces in the soil normally filled with air, have been filled with water and the water is more than likely to be sat on the surface. Why does it matter? Well all plants need oxygen at their roots, the micro organisms that live in the soil need oxygen within the soil. So basically life within the soil needs oxygen. Without it in the soil, plants and life within the soil dies. The longer the garden is under water, the more chance the roots and life within the soil has of drowning. A few days might be manageable, weeks and weeks will cause problems unless the plant is one that’s adapted to that environment like say Salix, otherwise damage will occur. It is never a case of the plant just dying in a few days, sometimes it can take months for the effects of prolonged water logging to kill a plant, it normally happens when the tree has got all the leaves open in full summer, when the most pressure is being applied to the damaged root system. You can normally tell by the leaves going yellow, growth is stunted or looks like it suffering from lack of water. If you lift it up, you will find the roots have some black and generally speaking it stinks of a sour rotting stagnate smell. And of course, it effects some soils more than others, sandy soils and thin soils over chalk, tend to dry out quicker, it’s the heavier soils like clay, that are more problematic with heavy spells of rain. It also breaks up the natural structure in the soil, effecting the soils natural drainage. It’s worth remembering that the heavy rain washes the nutrients out of the soil, nitrates, potassium and sulphur are particularly effected. So it is well worth giving the beds a good feed of a balanced fertiliser like Vitax Q4 in the spring. It can also be worth testing the soil first, to see if and what it requires. Organic matter helps to increase the air gaps within the soil so adding well rotted compost to the soil surface will help to add the nutrients that the plants require but also help to increase the air gaps in the soil. It also feeds worms and the movement of worms though the soil adds air to the soil as well, some worm species like lob worms, help to breakdown compacted areas. The organic matter also provides a cushion between the soil and feet, reducing compaction. Biochar has also been found useful aid to the soil. It helps to reduce leaching of nutrients, increase air spaces and aids colonisation of mycorrhizal in the soil. That is very useful after longer term water logging. If you have drainage ditches or pipes, check them to make sure they are running effectively. Best weather ironically to check it when it’s pouring down with rain! Be wary with plants like conifers or indeed other plants from bulbs to trees The damp conditions are suitable for root fungal attacks from one call Phytophthora. It’s hard to tell apart from normal root decay death apart from on some woody plants there maybe a brown/black up side down V shaped at the base of the stem. Next post: Dalefoot composts- The ericaceous trial! Thank you, that’s a useful post. My border edges are just standing water. I have taken a fork to them to open up some drainage, but that soil being clay just squelches and the water hardly drains. Fingers crossed there is not too much plant loss. I would say that this does not come up often in a chaparral climate, but I happen to work around riparian situations often now, and parts of our landscape are very saturated because of a high water table. Thank you Sophie, yes everything is getting soaked again isn’t, next week here looks pretty iffy once more sadly. Yes totally mad!